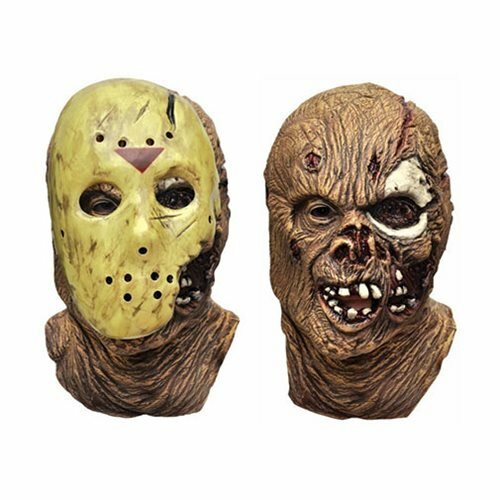 Featuring a removable plastic hockey mask, this Freddy Friday the 13th Part 7 New Blood Jason Deluxe Overhead Mask is a collector quality piece! If you want to dress up like the real deal for Halloween, or simply want to spruce up a mannequin you've got lying around, you're going to want this awesome mask. Not only does the mask on the mask feature some incredible detail, but once removed you'll see just how awesomely deformed Jason Voorhees looks sans mask, too! Sport the same look Jason does in the movie Friday the 13th Part VII: New Blood.